We almost always eat dinner together. Rajat and I have done that since we first got married. Even if one of us is working late, we wait for the other. Eating together as a family became even more of a priority after Surya started eating real food. It gives us a chance to sit down with her. To tune everything else out. To turn everything else off (literally). We ask her how her day was and what did she did – even if she doesn’t always answer on point. Life and work get in the way and sometimes, we just need a dinner without food flying and reminders to use your fork – so we don’t always eat with Surya but we try to do it at least a few times a week. The biggest challenge to sitting down to dinner of course is no surprise. It’s the dinner part! The food itself. Unless it’s “one of those weeks”, we don’t order in dinner except for a Wednesday night hump-day treat. This is in large part because our Brooklyn neighborhood – Dumbo – has few restaurants which deliver. Narrow that to those which deliver with vegetarian options, and we are left with two choices. I just found two new things that I suspect will make weeknight meals easier. The first is Mark Bittman’s How to Cook Everything Vegetarian iPhone app. I love Bittman, but I was a little skeptical about this book because he’s not vegetarian. I am automatically suspicious of omnivores who claim to know how to cook everything vegetarian. I’m also suspicious of anyone who claims to do everything. I haven’t used a lot of his recipes, but I really like how the app is organized with basic techniques for ingredients that you can use to build recipe ideas and variations for recipes. It also works underground which means I can read it on my subway ride to/from work for ideas. This means that as soon as I get home, I have a game plan for dinner. The second is Baked Tofu (which I looked up on Bittman’s app on my way home from work Friday evening). Baked tofu is versatile – you can use it in curry, stir fry, pasta, salad or sandwich. The downside is that it takes about an hour to bake. But once you put it in the oven, you don’t have to babysit it. And since I knew that baked tofu was my plan, I put it in the oven as soon as I got home. Even better – I baked two cubes and refrigerated one to use in a few days. 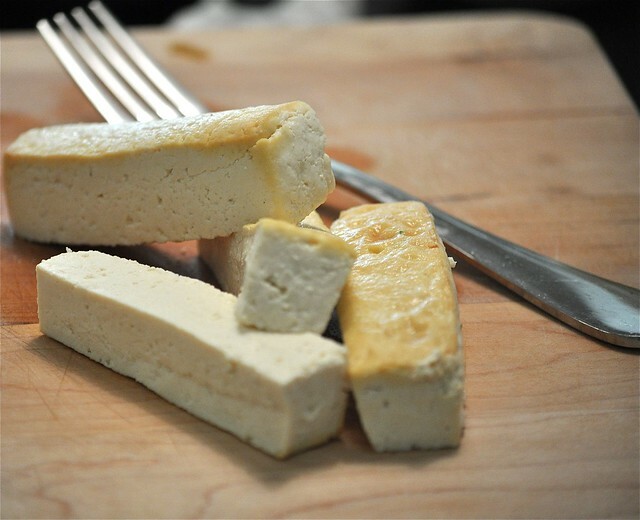 Baked tofu has a chewy consistency (less than deep frying but much more than braising). You can flavor the tofu with soy sauce or any other rub that you would use for meat. After baking, cube the tofu and use in stir fry, pasta, sandwiches or a salad. Drain water from tofu package and blot with a paper towel (be gentle so you don\'t break the tofu). You don\'t need to press the tofu. Place tofu in a nonstick baking dish (one with sides because the tofu will lose water as it bakes). Sprinkle with salt and pat it onto the top and bottom of the tofu. Bake for about 1 hour until tofu browns. Flip the tofu and broil on high until golden brown. Well, that looks easy. Dinner together is a difficulty for us, since I’m the cook and commute an hour each way, but I often prepare tofu ahead of time and just toss it into whatever the kids are eating. Your version seems especially easy. Your neighborhood is cute, by the way. I’ve never tried to bake my own tofu before — I usually pan-fry it. It is definitely messy and probably less healthy, though, so I’ll have to give this a try for sure! 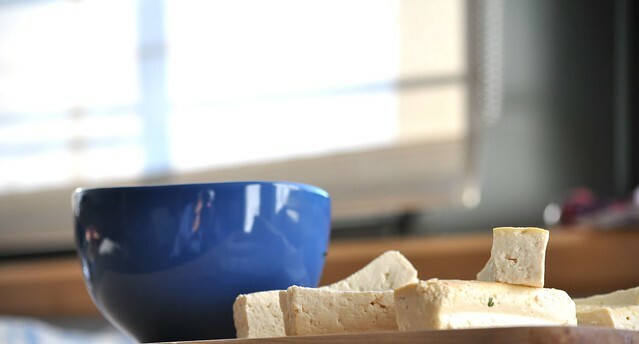 I have never thought about baking tofu but what a great idea… I will give your easy recipe a try! Let me know how it turns out! So easy and really great texture. Just don’t overbake it. The outside gets too tough.